What do you think of when you picture an auto service or collision repair shop? It’s not the dimly lit, grubby environment of yesteryear that you might imagine. You’ll see technicians working on cars, of course. But you’ll also see them consulting computers and working in bright, open spaces. At the desk, the service advisors answer difficult questions and guide customers through the process of having their vehicles repaired or maintained. Technology and customer service are paramount. IIt’s a great time to introduce your students to the auto industry of the 21st century and all that it offers. Students who earn a degree from an automotive program are virtually guaranteed job placement. A degree in auto service and repair or collision technology opens the door to a variety of career paths within the industry. Students will thrive with hands-on educational training and will then go on to enjoy a hands-on work environment. Students can earn a degree and start full-time in as little as two years, and most students find jobs while they’re still in school. With the increase in demand for qualified auto and collision repair technicians, students have a huge opportunity for rapid career growth and advancement. With a two-year degree, students have access to technology-oriented careers where computer diagnostics and complex electronic systems keep technicians learning and problem-solving every day. As graduates’ knowledge, hands-on experience and skill sets expand, so do their salaries. The median salary for auto technicians is $39,550, and senior-level technicians earn more than $60,000 per year. Superstars can make six figure incomes within the industry. We hope you will share this helpful, accurate information on a booming industry that can challenge students of all interests. 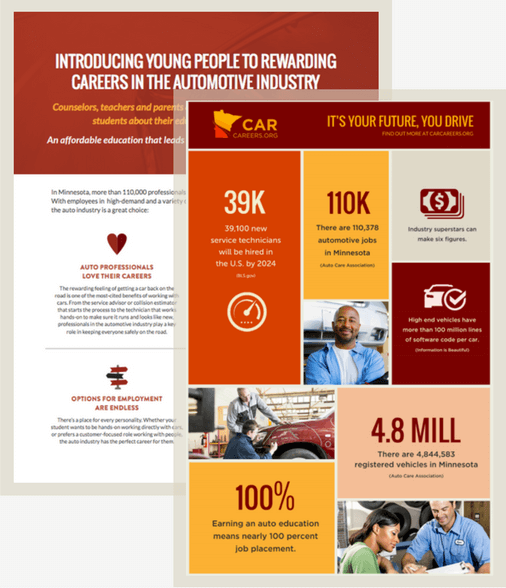 Download our resources to help students learn more about how they can find a career they are passionate about it the auto industry.